Cabin fever can be a tough taskmaster to tame during our winter season. From the kids’ tiring of toys and sibling struggle for attention, and your own need to escape the confines of your home without wandering aimlessly towards the mall, coming up with daytime activities that don’t involve indoor playparks can be a challenge. 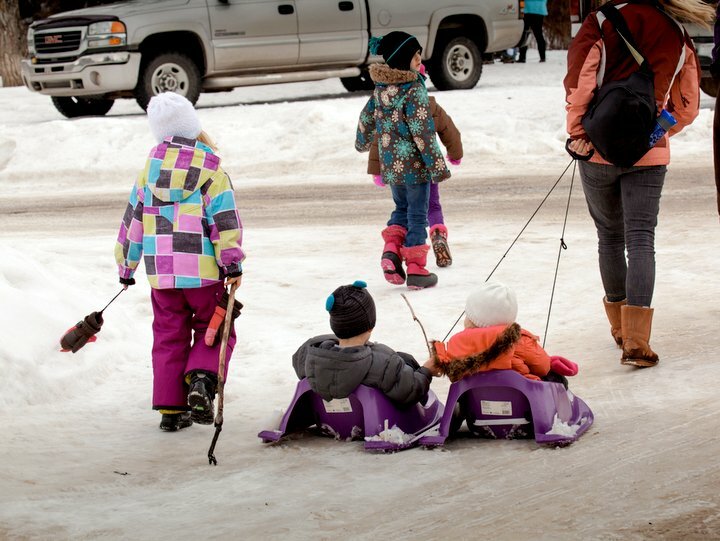 Luckily, Edmonton winters offer more options for activity than you thought! Escape the ease of video games or the slow draw of sales at the mall by checking out these 19 ways to get outside this winter, without a day trip to Elk Island or a 10-minute trip to the mall. Winter activity availability can be subject to changes in weather or recent snowfall levels, so make sure to know conditions or check the links before heading out! If you haven’t been to the Edmonton Valley Zoo in the winter, you’re missing out. The animals are active (often interactive), the crowds are thinner, and grabbing a warm-up hot chocolate at the Wild Earth Café makes a great treat! Participate in daily drop-in programs that connect you with nature, or chat with the staff for tips about hiking around the area after your visit. The John Janzen Nature Centre and surrounding area is a great way to connect with & learn about nature outside, with the opportunity to return inside for a play zone, and more great learning opportunities! Visit River Valley Adventure Co and take a guided tour through the river valley around Louise McKinney Park or into downtown on a Segway, or spend the day exploring the river valley while by renting fat bikes for the family, described as smooth as riding a magic carpet. Remember the tube rides you loved at the water park? Sunridge Ski Area has you covered in the winter. With up to 4 tube chutes operating each day, you’ll be able to spend hours at this hill overlooking the river valley, with plenty of opportunity to stop in the pro-shop for a warm-up and snack. Heads up: This is a popular spot, and frequently sells out. Book online ahead of time for best results. Ski or snowboard, Edmonton has a hill for you, even if you don’t have your own gear. Rentals, lessons, and beginner hills can be found at Rabbit hill, Snow Valley, and Sunridge ski Area. While many of the below activities are free, some may require some gear. Make sure you check the links to find out what’s available at city facilities, or check retailers like MEC, Totem Outdoor Outfitters, or River Valley Adventure Co for great rental options! Anytime you’re hiking in the winter, it’s a good idea to have a pair of slip-on ice grips in your pack – you won’t know how great these are until you try them. Feel the whoosh, and embrace the whee! If your local park hill doesn’t give you the thrill it used to, the City operates 7 hills of varying size around the city. It’s a Canadian tradition, and an Edmonton way of life. With 100+ rinks in neighbourhoods around the city, 2 iceways, and rentals available at William Hawerlak Pavilion or retailers like MEC or Totem Outdoor Outfitters, it’s easier than ever to participate in this traditional past time. Note: Please skate safe. Storm water ponds are never safe. EPCOR has put together a great set of maps to identify the safe places to lace ’em up. While guided snowshoe tours can be found in the city, all you really need is snow! There are great snowshoeing spots inside of town, or a short drive away! There are 9 parks across the city with groomed cross-country ski trails, serving for everyone from beginner to expert! Check our listings for trail conditions, as well as info on lessons from learning to ski – to how to wax. Exploring by bike in the winter gives you a terrific opportunity to see more of the city’s best sights in less time. Find your trail, and go discover why winter cyclists encourage people to just do it! Believe it or not: winter biking isn’t hard, you can do it without a fat bike or studded tires, and yes – your helmet will most likely fit over your pom-pom free toque. You don’t need to dress up any warmer than going for a winter walk, though we do recommend a good pair of gloves. Get the family outside and help a neighbour in need by being their Snow Angels. Not only does the job go quickly when you have the family working together, but you’ll be helping a neighbour who might otherwise have a challenging time leaving their home safely. Edmonton has all kinds of walkable streets that are filled with history, unique local stores, art houses, cafes, and diners. Take an afternoon to explore one of these Edmonton gems. Do some shopping, discover a neighbourhood, play in a new park, and maybe stay for a meal! Some of our favourite areas to check out are 124 St & Area, Alberta Avenue, the Ritchie Market, Old Strathcona and the Strathcona Farmer’s Market, or a stroll around Edmonton’s Riverdale, starting at the Little Brick Café. Happy Exploring! Sometimes, it’s easier to convince the kids to go for a walk when it’s a treasure hunt. And with today’s smart phones, you don’t even need a GPS device. Check out geocaches in the area, or even set up your own ahead of time for the kids to find. Geocaching is a fun way to explore neighbourhoods and get the family outside! Of course, you could always see if the kids are still into Pokémon Go. Overlooking the river valley at the South Edge of downtown, the Alberta Legislature Grounds are as much of a treat in the winter as they are in the summer. With well maintained trails, easy access to downtown or the river valley, and large snow-covered areas for playing, A trip to the Legislature is never a bad way to spend an afternoon. WinterCity Team Tip: Visit later in the day close to sunset, and watch the kid’s faces light up with glee when the lights turn on! Who ever said that kites were only for the summer! Take these tips from the Top of Denmark and get out there to enjoy watching your kite soar against the crisp winter sky! Starting at the North Saskatchewan River just off Fox Drive, Whitemud Park features walking trails, a toboggan hill, picnic sites, and the chance to see a multitude of wildlife and local equine enthusiasts. The Ravine stretches south all the way to 23 Ave, with 10 access points along the way, including near Snow Valley. There are incredible trails throughout the ravine, and the southern edge meets up with the equally impressive MacTaggart Sanctuary. Note about Whitemud Creek: While the creek may not be regularly deep, be cautious when crossing any frozen water. We could list all 20 parks in the river valley, as well as several of our favourite sections of the 160 km of trails. Let’s just say that if you can’t think of anything to do this weekend, you’re not trying hard enough. Find parks for playing, sledding, picnicking & more. Check out the trail system for your next family hike. Find the best place to go based on the activity you want to do. Grab the hotdog sticks, the ladder ball, a bag of marshmallows, and a thermos of cocoa. Winter Picnicking is where it’s at! Less crowds at Edmonton’s 11 picnic sites than during summer. You have a fire to warm up at between activities. The kids are bored of snowmen, and ever since they started reading Calvin & Hobbes, you’ve been questioning their choices anyway. Channel that creativity and make your yard the best winterscaped yard on the block. Fill water balloons and add food colouring to create colourful walkway decorations, create snow or ice sculptures, incorporate a maze for Fido, or give your Christmas lights a new life as winter lights! If exploring these activities doesn’t fill your winter calendar, dig your shovel into our winter events calendar. With over 70 festivals & events happening from November to March, there’s no reason to stay indoors!